TPU reports Prolimatech is toying with two new cooling designs for Intel's LGA2011 platform. Revealed below is a slimmer version of the Prolimatech Genesis that stacks both heatsinks parallel to the plane rather than perpendicular. The company also shared CGI-renderings of a new design in which the heatpipe takes three sharp U-turns, with an aluminium fin stack in each of these U-turns. 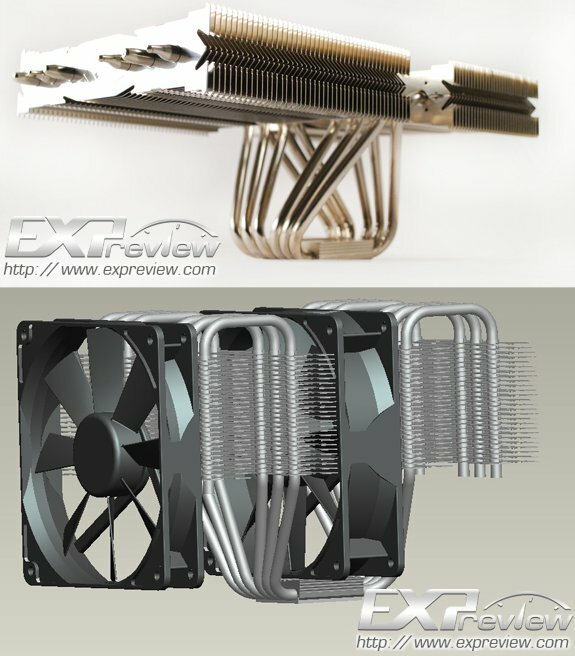 The second cooler (last two images above), has a slightly more exotic shape, in which the heat pipe take three sharp U-turns, in the long-arms of each of these U-turns is an aluminum fin stack, and the CPU base is in the center. Unlike the other cooler design, this cooler has a side-flow ventilation. The aluminum fin stacks don't propagate all the way down, to make room for the memory areas below. As for the ventilation, a single 120 mm fan can be attached in the central portion, more fans can be attached to the aluminum fin stacks at convenient locations. There is no word on when (or if) this design will materialize.